Why should I choose Parenta for training? Parenta is a leading training provider in the Early Years sector. We support thousands of learners completing their childcare qualifications across the country every year, by providing innovative learning resources and assessor support. Our objective is to get you qualified in a way that suits you. There are two ways to register your interest in starting a course with Parenta. Either complete the form on an individual course page or call 0800 002 9242 to speak with one of our friendly training advisers. I work full time. Will I still find time to study? Yes. We offer flexible e-learning solutions that allow you to fit study around work and social commitments. You’ll also have access to online training resources and full support from your assessor, providing an ideal approach for you to gain your qualification. How much work is involved per week? The work involved varies depending on the course, but, on average, there are 10 learning hours per week. How often does the assessor visit my setting? On average, the assessor will visit your setting every eight to ten weeks. How can I contact my assessor if I have a question/problem? All of our assessors are contactable via our head office address, their mobile phone or e-mail address. You’ll be provided with their contact details during the enrolment process.nnYou can also use an online platform called E-cordia to contact your assessor at any time during your course. Is there a set time to complete the course? Will my course be funded? The majority of our courses are fully funded and most of our learners don’t pay a penny for their training. However, this isn’t certain and the amount varies depending on applicable funding streams. A training adviser will talk you through your funding application during the course registration process. How much will my course cost if I’m not eligible for funding? The cost depends on the qualification applied for and your local authority. If you wish to find out how much your course may cost without funding, please call 0800 002 9242. How does an e-learning course differ from traditional paper methods? With e-learning, you have complete flexibility over how you learn. Both options consist of the same level of work, however, you may receive quicker feedback on assignments through e-learning due to the submissions being received instantly via email. E-learning also fits flexibly around work and social commitments, as the e-learning platform can be accessed quickly and easily from the comfort of your home. Will my course be a nationally recognised qualification? Yes. All courses are accredited by either CACHE, Pearson, Skills First, ILM or City & Guilds and recognised by Ofsted. What is the difference between an apprenticeship and a standard qualification? An apprenticeship covers additional work skills beyond the standard childcare qualifications. The skills and knowledge gained from an apprenticeship can be transferred into any professional sector, providing a better scope for career progression. To hear about the full benefits of completing an apprenticeship, please call 0800 002 9242. Dayshare helps you share all the day’s exciting activities with parents in the form of an online diary. You can personalise records for multiple children or an individual child by adding your comments and observations, then send it to straight to parents’ inboxes. What information is shared with parents? Dayshare captures every aspect of a child’s day including: how much they’ve eaten, wet and soiled nappies, number of naps and what activities they’ve been doing. You can also send parents gentle reminders about upcoming events, changes to routines and even a request to settle an outstanding invoice. What is the software compatible with? Dayshare works on PCs, android tablets, Macs and iPads. Does Dayshare link to any of your other products? Dayshare is directly linked to the information held in Abacus nursery management software, which populates the register. At the end of each day, each child’s Dayshare report is saved to their record in Abacus. How do parents receive their Dayshare record? You can send a Dayshare report as an email at any point during the day. If you then add more information, you can simply send it again later. Once the email lands in parents’ inboxes, they can then forward this to family and friends anywhere in the world. What support will my staff get whilst using Dayshare? Dayshare is really easy to use, so it shouldn’t take very long for you to find your way around it. However, we’ll give you and you staff members as much support as you need until you’re completely comfortable using it. Our team are available from 8am-8pm, Monday to Friday, if you ever need to ask a question. Does Dayshare archive child’s information? Yes – nothing is ever lost from Dayshare, so parents and staff can access reports from any day. This makes it easy to check a child’s progress and remind carers what happened on any given day. Footsteps will make it quicker for you to find out where each child is in their development by linking your observations to an online version of the EYFS. It can also show you the next development steps in specific areas, like Maths, enabling you to plan suitable activities to help children thrive. What devices are compatible with Footsteps? Footsteps is flexible and can be used on a variety of devices including desktop, tablet and mobile devices; making it simple for you to update information whilst working in a busy setting. How will this software help me with Ofsted inspections? When Ofsted visit, Footsteps will allow you to show how one child or a specific group of children have progressed since they started at your setting. Can I link photos to my observations? Yes – you can capture photos to illustrate your observations and link these back to the EYFS curriculum as you go. How will this software help my team? From the observations your team upload, Footsteps automatically calculates where each child is in line with the EYFS curriculum for them. This can be really helpful, especially for junior staff who are struggling to familiarise themselves with the EYFS. What support will my staff get whilst using Footsteps? Footsteps is easy to pick up and start using without any special training. However, we’ll give you and your team as much support as you need until you’re completely comfortable using it. We’re available to talk to from 8am-8pm, Monday to Friday, if you ever need to ask a question. How does fee collection work? Very simply, fee collection is a direct debit service which collects payments from parents’ accounts at the same time every month. The money is then transferred safely to your setting’s bank account. Does your fee collection service link to any other of your products? Yes – our fee collection service links to our Abacus nursery management software. This will save you time as Abacus creates the collection file through invoicing and automatic payment reconciliation is available. How long will it take to set the service up? After you’ve filled in the initial application form, we’ll send you direct debit mandates to be completed by your parents/carers along with your welcome pack. These mandates should be returned to Parenta’s offices by the first working day of the month for collection from the following month. These can be sent over all in one go or in a several different instances. We’d recommend you allow 2 calendar months to set up this service. How does it compare to taking money on credit card? When taking money on a credit card from parents, you will likely incur charges on your business account of around 2%, and you may need to keep reminding parents every month that they need to pay. Using our fee collection service, the direct debit is taken out of their account at the same time each month, with no hassle and no chasing needed. There is no risk to you at all, as the service is provided by and managed through Parenta. What’s more, all payments made by parents will be covered by the Direct Debit Guarantee. How will parents be notified? Parents will be notified around 3 days beforehand by email as to how much will be taken from their account. Will it be a big change to how I currently work? Automated fee collection will completely change the way your setting works. For a start, you’ll never need to worry about whether you’ll be paid on time and there’ll be no need for you to chase parents for payment. This means you can keep childcare completely separate from collecting money, enabling you to focus on building a great partnership with parents. What happens if the money is not collected? If the money is not in a parent’s bank account when we attempt to collect it, we’ll write to them explaining it could affect their credit rating and charge them a £20 fee. We’ll give them the date of a second collection and ask for the funds to be available for collection. We find that once parents have received a letter and charge, they don’t miss further payments. Can I only have my fees collected if I have Abacus? Although our fee collection service works great with Abacus and the collection file is automated, this can be operated on its own. We’ll contact the parents, collect their fees and pay them into your bank account, as well as emailing you a payment summary. How has it impacted other nurseries? Nurseries who use our fee collection service have stated that the biggest burden they’ve faced prior to using this service was getting money from parents and paying staff their wages. Having fee collection in place has totally removed this burden. Our customers are then able to maintain a great relationship with their parents/carers whilst we do the chasing. How do I book my free nursery management software demonstration? 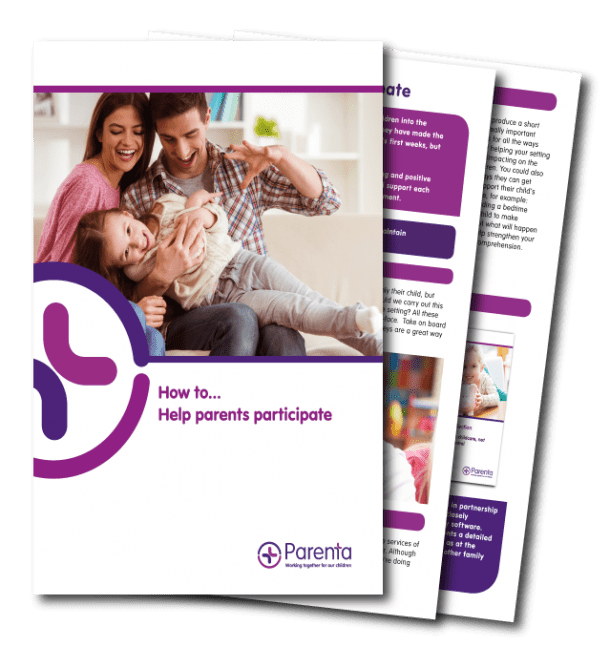 There are 3 easy ways you can book your demonstration: fill in a form, email contact@parenta.com or call us on our free phone number 0800 002 9242. You can then choose to have a face to face appointment with one of our friendly consultants or (if you’re short of time) they can show you the system over the phone via a screen sharing session. The cost of the software varies depending on the size of your setting and any applicable discount, which is agreed on a case by case basis by our business development consultants. There is an initial set-up fee and a monthly subscription cost. Can I trust Abacus to keep personal data safe? Yes. Having Abacus in place is much more secure than a paper based system! With all your records stored safely online, your children’s personal details cannot be lost, misplaced or damaged. You can even lock down parts of the system so that only certain members of staff have access to it. What training arrangements are there for my staff and I? Abacus is a really easy to use, so it shouldn’t take very long for you to find your way around it. However, we’ll give you and you staff members as much or as little support as you need in order to feel comfortable using it. Our team are available from 8am-8pm during the week, and we also hold regular in-house training days which are free to all our Abacus customers. What support will I get if I have a question/problem? As soon as you join the Parenta family, you’ll be allocated your own Account Manager who will get to know you and your setting personally. They’ll be your first point of contact should you have any questions regarding Abacus, and you can email or telephone them directly. Alternatively, you can submit a ticket via our support helpdesk. We aim to resolve all queries within 1 working hour of being notified. Are there any useful add-ons to Abacus? Yes – we have several options which include: Dayshare, an online daily diary for parents; Footsteps, our EYFS tracker system; Parent Portal, for parents to check their child’s records; and automated fee collection to make sure you never miss a pay day. We do offer discount off the price of Abacus if you decide you’d like to buy multiple Parenta products, however this is at our discretion and should be discussed during the initial consultation stage with our business development consultants. How long will it take to set the software up? Due to the initial data transfer and the fact that each system is personalised for your setting’s needs, it takes on average X weeks to set up (from the point you place your order). However, we’ll always work closely with you and do our best to deliver the software in a time frame which suits you. On average, it takes 6 weeks to build a website from a draft to the time it goes live. However, if you’d like to have your website up and running in a quicker timeframe than this, it is possible and we’re happy to discuss this in further detail with you. What are the different build options? We offer two different products – a custom website or a bespoke website. A custom website takes an existing design and is then customised to your style within the limits of that template. If you’re looking to start from a blank canvas and have more scope, then a bespoke website would be more suited to your needs. We ask that you send your current logo, prospectus (if you have one) and the names of pages you’d like to appear on the website. We also ask that you provide us with your own written content for each of these pages. How many drafts will I get? Although we involve you and ask for your input throughout the entire build process, we put together 3 draft versions of your website for you to look and sign off before it goes live. Who will update the website once it’s built? After your website has gone live, we’ll send you a guide showing you how to make changes to it directly. However, our design team is also happy to talk through anything you may wish to add/ remove from your website over the telephone. Can I have social media on my website? Yes, we can link your setting’s social media page to your website and create a running newsfeed. If you don’t currently use social media, we can set up a Facebook/Twitter account for you, then it link across. Can I set up an email account? If your domain is with Parenta, we’ll be able to set up as many email accounts as you would like. Please note that each email account will be charged at a small cost per year. Yes, if you currently have a website and as long as you own your domain, you can continue to use it. No, we have a large selection of stock imagery and can provide this to you if needed. Will my site be mobile optimised? Yes, you can view the mobile version of your site on any smartphone.